Use the quick form on the right to send Marc an email. 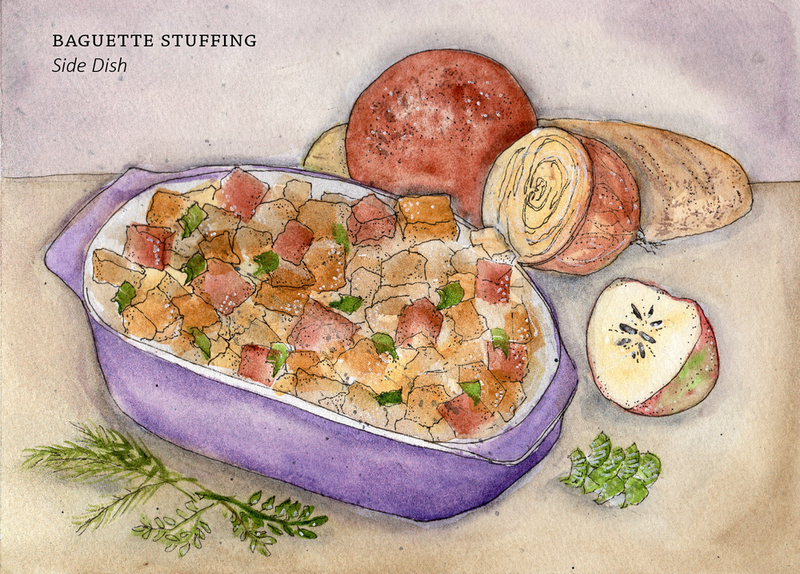 Like many of you, stuffing is one of my favorite parts of a Thanksgiving meal! Instead of preparing a stuffing from a bag (boring! ), my Baguette Stuffing only takes a few steps and the result is just delicious and fabulous! The combination of French bread and rye bread gives this dish a real depth of flavor, along with all of the fresh vegetables, herbs, and of course butter! This recipe is as equally wonderful with almost-ripe pears. Simply substitute the apples for pears and follow the same cooking directions. You can also change the cashews for almonds, or even pecans. Your traditional bread stuffing is about to get a major flavor makeover! Place the bread cubes on a sheet pan and toast them in the oven for 10 minutes. Meanwhile, in a large sauté pan set over medium-high heat, melt the butter. Once melted, add the onion, celery, apples, garlic, parsley, rosemary, thyme, salt, and pepper. Sauté for 15 minutes, tossing occasionally, until the mixture is soft. In a large bowl toss the bread, onion mixtue, vegetable broth, and cashews. Transfer to a 3-quart baking dish. Cover tightly with aluminum foil and bake for 30 minutes. Remove the foil and bake for another 20 minutes, or until the top is golden brown. Order a signed copy of my cookbook Entertaining with Love! Subscribe to Marc’s YouTube Channel! © 2019 MJS and Marc-Ryan Group All rights reserved.